The International Development (IDEV) program educates and trains development practitioners who are passionate about finding sustainable solutions to end poverty. Helping countries and communities to overcome the problems of poverty, disease and exclusion, and to protect human rights are among the biggest challenges our globalized world faces today. 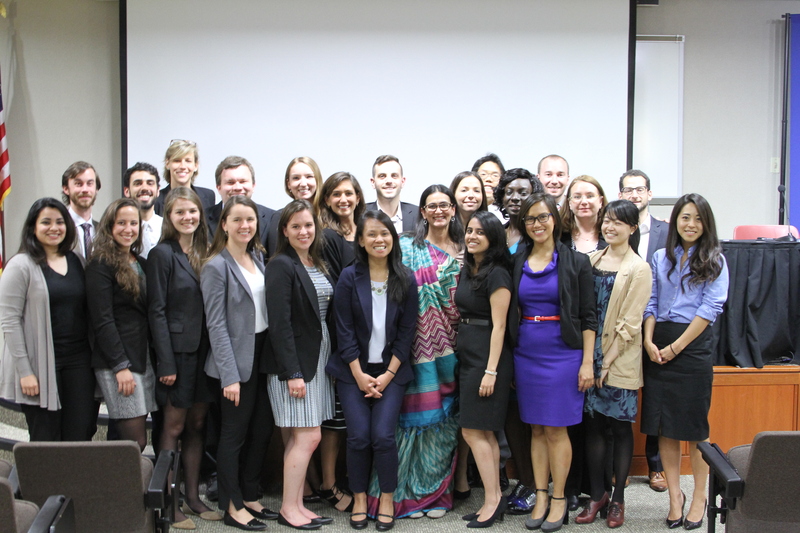 The IDEV program nurtures a corps of international development practitioners for leadership roles in policy and practice. The International Development (IDEV) Program provides an interdisciplinary approach to the study of developing countries, with the aim of preparing students for careers in development. Students in the IDEV Program receive rigorous academic training that helps them better conceptualize the development process in its economic, political and social dimensions. Bologna IDEV students attended the 2019 Wiener Ball der Wissenschaften in Vienna. Pictured left to right: Sannidhi Srinivasan, Maria Naranjo Quintero, Minaj Singh, Fredrick Toohey, Pauline Koch, Kimmi Vo, Jiayuan Wang, and Danielle Minnett (missing). Coordinated and led by IDEV students, this events series provides speakers the opportunity to address the challenges of global development assistance and to suggest new initiatives that will improve the field. Learn more about the Development Roundtable. 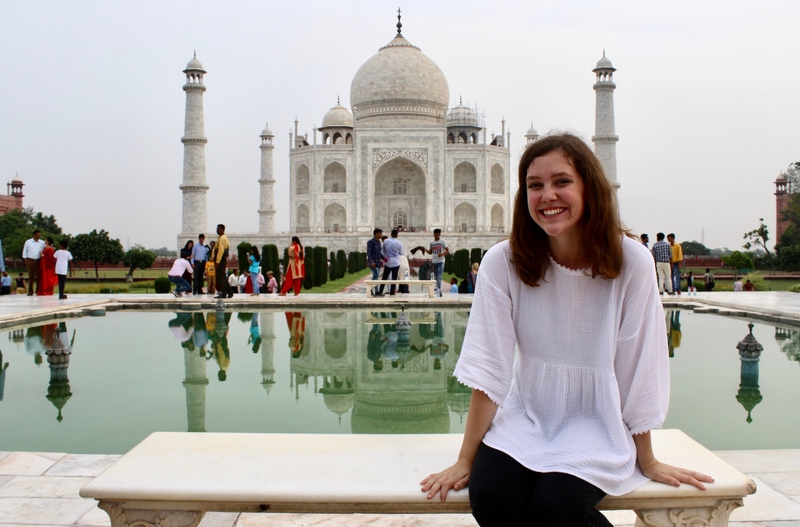 Savannah Newman took time to visit the Taj Mahal during her summer internship with the Mann Deshi Foundation in India. 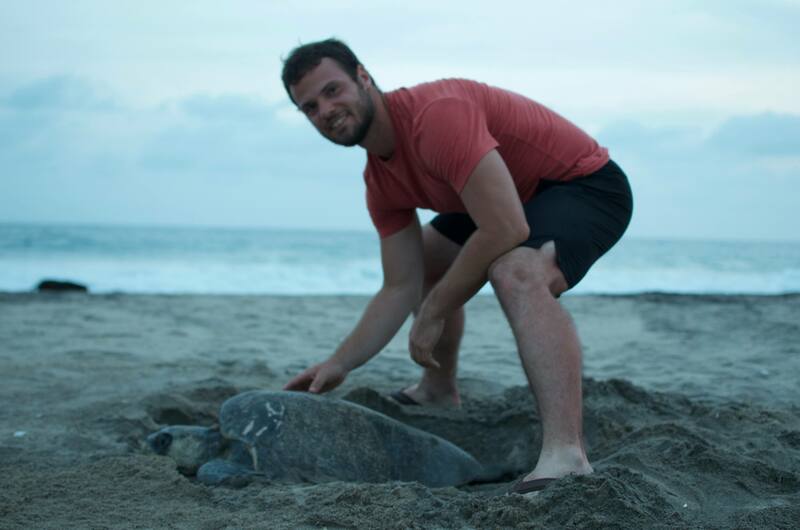 Charley Allegar got up close and personal to a turtle during his internship at Save the Children in Mexico. Each spring IDEV publishes Perspectives, with articles on cutting-edge issues in development, many written by IDEV faculty, students and alumni. Each annual issue focuses on a specific theme of development. The editorial team has launched a new online platform http://www.saisperspectives.com/ in November 2014 to host the IDEV program's perspectives on international development. You can visit our archive here. AY2018-19 Perspectives Annual Launch event was held on October 23rd, 2018 and it is available for viewing here. Students concentrating in International Development (IDEV) must complete at least 24 credits of applicable coursework and a program capstone. IDEV concentrators must complete a Plan of Study and have it approved by the program. In addition, International Development concentrators must complete constrained International Economics and Quantitative Reasoning courses. Students may not double-count the constrained International Economics or Quantitative Reasoning courses toward their concentration. IDEV concentrators must complete Microeconomics (with a grade B- or above) prior to matriculating at SAIS through Summer, Non-Degree, or Pre-Term programs or by passing the waiver exam. The concentration requirements, along with the other requirements for the MA, can be found on the IDEV Requirements Chart. Students who wish to add a second policy/regional concentration must choose IDEV as their primary concentration. Students may not double-count the constrained International Economics course toward their 6 required IDEV concentration courses. In the standard case, the concentration GPA is the average of the grades in Macroeconomics, International Trade Theory, International Monetary Theory and the Constrained IDEV economics course. If one or more of the required courses is waived, the highest grade(s) from any eligible replacement International Economics course(s) is used. Students must complete one course from the list below as their constrained IDEV course. Students may not double-count the Quantitative Reasoning course toward their 6 required IDEV concentration courses. International Development concentrators are strongly encouraged to complete Comparative Politics as one of the Core requirements. In order to expand the opportunities to work directly with public, private and non-governmental organizations, IDEV offers a two-semester Practicum class to second year students for credit. Successful completion of the Practicum also serves as a Capstone for graduating students. In academic year 2018-19, 24 students are enrolled in the Practicum. A practicum is a course designed to provide students the tools and opportunity to work with an external client on a development problem or opportunity. It allows students the opportunity to apply their research, analysis and practical skills to an issue that is of direct relevance to a client. The team of students works closely with the client to produce a high quality output in the form of a publishable report, policy or program that may be implemented by the client. In addition to allowing students to translate their knowledge into practice, the practicum experience also allows students to make valuable contacts with potential employers. How is the Practicum implemented? Approximately 20 second year IDEV students are eligible for taking the practicum as a course for credit, over two semesters. They are selected in the Fall semester based on their coursework, prior experience and demonstrated interest. Students form teams and work with a professor throughout the Fall semester to conduct research and design a proposal collaboratively with previously identified clients. They meet once a week to discuss research methods, their proposals, and progress with the professor assigned to lead their team. Teams undertake field research during winter break and complete a report to the client upon their return. Students are required to meet with the professor at an assigned class time each week. Every member of the team is held responsible for the timely completion of assignments. The practicum requires that student teams meet outside of class both with each other as well as with the client. The entire team is held responsible for coordinating logistics with the client. Students are evaluated both individually and on the basis of the final product that they deliver to the client. Professor Deborah Brautigam, Director of the International Development Program, has been quoted in Foreign Policy magazine saying that the practicum "gives students an invaluable, hands-on experience to work with an international development organization and address an important development challenge. Participants often say their practicum work was one of the most important experiences they had in graduate school. These are not research projects. Practicum students address practical problems that the client needs to solve.” To read more about the the Practicum program in the Foreign Policy Guide article, click here. In AY 2018-19, 24 students were selected for the IDEV Practicum. Six teams will travel to Taiwan, the Caribbean, Nepal, India, and Angola to support their clients. New Balance (Taipei, Taiwan): The New Balance team is evaluating the presence of forced labor and recruitment fees in New Balance's global supply chain, with a particular focus on the company's Tier 1 and Tier 2 suppliers. PANCAP (Antigua and Barbuda, Bahamas, St. Lucia, Trinidad and Tobago): The PANCAP team will be working with the Pan Caribbean Partnership Against HIV/AIDS (PANCAP) to conduct a cost-benefit analysis of the World Health Organization's "treat all" HIV/AIDS policy for four countries in the Caribbean region. To this end, our team will be conducting a broad economic analysis of the region to create an overarching research report on the regional implications of the policy, as well as country-specific economic analysis reports. Additionally, we will be creating a standardized cost-benefit analysis tool that will be used at the country level to determine the actual cost of advancing the "treat all" policy. Winrock (Kathmandu, Nepal): The Winrock team will travel to Kathmandu to conduct research on how Winrock’s employment platform, Bong Pheak, can be replicated in different contexts to reach unskilled and low-skilled workers and connect them to employment opportunities regardless of qualifications. The team will create a case study to document Bong Pheak’s transition from a USAID-funded project to a social enterprise and draft a business plan to be guide replication of the platform in other countries and/or migration corridors. Athena Infonomics (New Delhi, India): The Athena team will be supporting Athena Infonomics’ ongoing research for the Gates Foundation by analyzing the challenges to the effective operation of the cooperative banking system and government crop procurement system. These institutions have the potential to help poor farmers in Uttar Pradesh access higher prices, but Athena’s research has found that many farmers are unable to benefit from them. Based on desk research, data collected by Athena, and interviews in the field, the team will recommend interventions to help make cooperative banks and government procurement more reliable sources of support for farmers. ­Global Alliance for Improved Nutrition (GAIN) (Bangalore, India): The GAIN team is researching technological innovations in India's agribusiness sector, specifically in Bangalore, that can help improve access and affordability to nutritious, safe, desirable and healthy foods. We will be identifying supply chain paint points and replicable, scalable technological solutions to these issues. Jefferies (Luanda, Angola): This team will work with Jeffries and the SAIS China Africa Research Initiative (CARI) in Luanda to conduct research on Chinese loans extended to Africa, with a focus on interpreting the principles China would apply in its restructuring of sovereign debts to Africa. In AY 2017-18, 24 students were selected for the IDEV Practicum. Six teams travelled to India, Cambodia, Vietnam, and the Philippines to support their clients. Global Alliance for Improved Nutrition (GAIN), New Delhi, India - The GAIN team investigated the sanitation and nutrition environment of street vendors serving perishable, freshly-cooked food and identified challenges and opportunities in serving the urban poor in New Delhi and Jaipur. The research focused on perceptions of an enabling/disabling environment for street vending, the urban supply chain, and demand and created an assessment tool to measure the street vending sanitation and nutrition environment which GAIN can use for determining areas for future programmatic interventions. Final Deliverable. International Finance Corporation (IFC), Manila, Philippines - The IFC team conducted global stocktaking of successful models for financing young entrepreneurs. They compiled a set of case studies to identify best practices and lessons learned to inform concrete policy recommendations for the G20's Global Partnership for Financial Inclusion. International Development Enterprises (iDE), Hue, Vietnam - iDE is an international non-profit organization dedicated to creating income and livelihood opportunities for the rural poor, in Vietnam. The goal of this team's project was to develop a business case on the replicability of Hydrologic, a viable social enterprise started by iDE in Cambodia, in the Vietnam context. Hydrologic manufactures, distributes, and sells water filters in rural Cambodia and has to date successfully sold over 500,000 filters to households at the base of the pyramid. Final Deliverable. LV Prasad Eye Institute, Hyderabad, India - This project aimed to assess the cost effectiveness of LVPEI, a network of ophthalmologic clinics in India serving over 2.5 million mostly-low-income patients in India. Additionally, it performed an operational analysis of a select sample of primary care centers. Altogether, the results helped the organization improve its allocation of resources while getting a better understanding of its impact to the communities it serves. Final Deliverable 1. Final Deliverable 2. Water.org, Phnom Penh, Cambodia - This team worked with Water.org in Cambodia to design a business model for scaling-up access to Water and Sanitation Services (WSS) for financially excluded people through Digital Financial Services (DFS). Final Deliverable. Athena Infonomics, Chennai, India - The Athena team worked to identify a social infrastructure project in India that was a viable candidate for a Social Impact Bond (SIB) funding and partnership structure. They then proposed a primer for such SIB structure for the selected project based on consultations with potential investors, implementing partners, government officials, and other relevant actors. Final Deliverable. 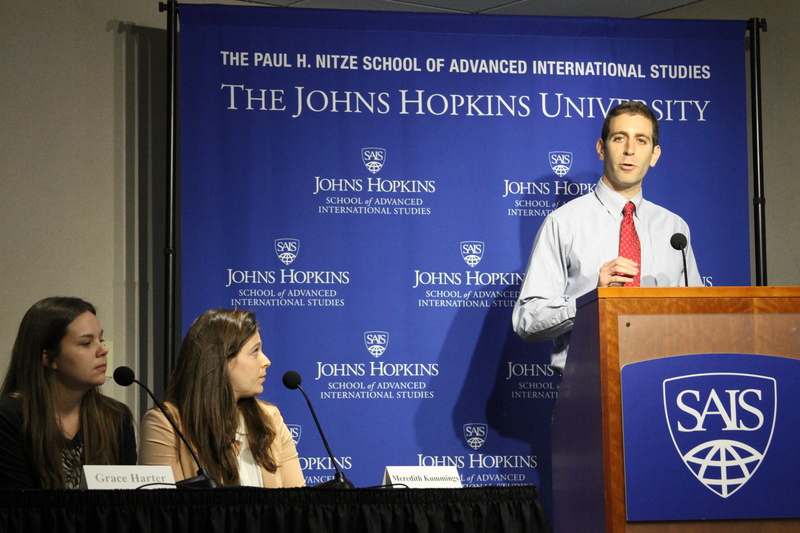 © All information contained herein is the sole property of Johns Hopkins SAIS International Development Program. Any unauthorized use, such as distributing, copying, modifying, or reprinting, is not permitted. To obtain permission to reproduce or distribute this document contact saisidev@jhu.edu. Global Alliance for Improved Nutrition (New Delhi, India) - Improving Municipal Nutrition Security in New Delhi: identifying key blockages in the value chains of selected nutritional food items in Delhi in order to propose intervention points for the Client. Final Deliverable. World Wildlife Fund (Beijing, China) - Promoting trade and investment in Green Products (GPs) between China and Kenya: develop key products and sectors in China, in tandem with team in Kenya, where GPs have the greatest economic and environmental benefit for China-Africa economic interactions. Final Deliverable. World Wildlife Fund (Nairobi, Kenya) - Promoting trade and investment in Green Products (GPs) between China and Kenya: develop key products and sectors in Kenya, in tandem with the team in China, where GPs have the greatest economic and environmental benefit for China-Africa economic interactions. Final Deliverable. International Center for Research on Women (Kampala, Uganda) - Strategic planning for the recently opened ICRW African Regional Office: Stakeholder analysis and strategic proposal to guide the development of ICRW’s activities in Africa. Final Deliverable. Quona (Mumbai, India): Implementing the agile development model to enhance Quona’s social performance management tool and facilitate the adoption of common valuation practices among portfolio clients. Final Deliverable. Athena Infonomics (India) - Maternal and Child Health Data Management: Understanding the challenges around and improving MCH data collection, management, and analysis. Final Deliverable. IDEV AY2016-17 Practicum Client Presentation on 4/26/2017 with Presentation Video and PowerPoint Presentation, as well as a Storify. Athena Infonomics - City Development, India: Final Deliverable. 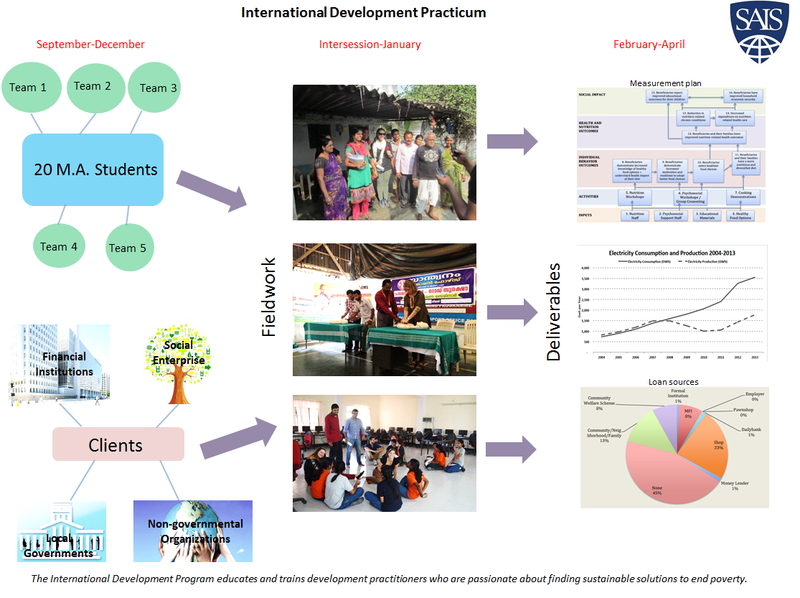 Athena Infonomics - Sanitation Planning, India: Final Deliverable. International Water Management Institute, Sri Lanka: Final Deliverable. Sino-Africa Centre of Excellence Foundation (SACE), Kenya: Final Deliverable. Zhongfu International Investment Company, Nigeria: Final Deliverable. IDEV AY2015-16 Practicum Client Presentation on 4/27/2016 with Presentation Video and PowerPoint Presentation. 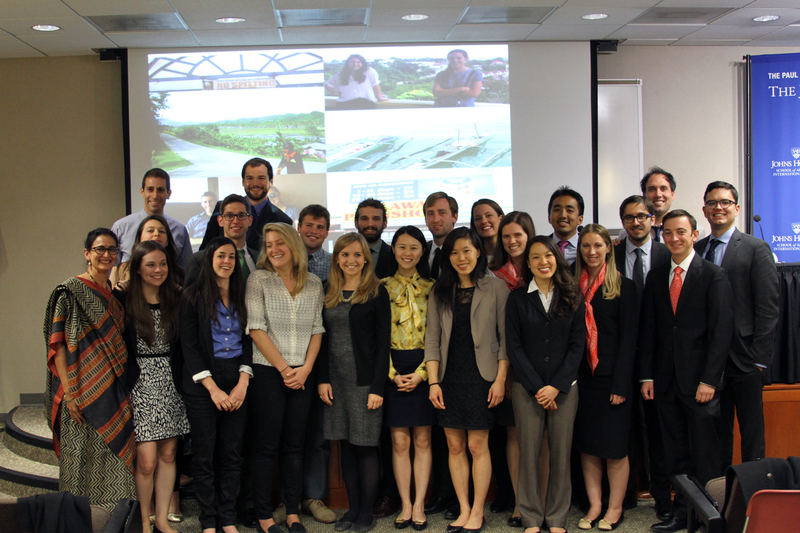 In AY 2014-15, the Practicum grew to include 22 students who traveled with their teams to Cambodia, the Philippines, China, India and Mexico, based on the location of the client and the project. Consulting teams once again negotiated a demanding terms of reference with their clients and produced an array of high quality outputs, described below. FEMSA Foundation, Mexico: Final Deliverable and Measurement Plan. Mercy Corps, the Philippines: Final Deliverable. Private Financing Advisory Network-Asia, Cambodia: Final Deliverable. World Resources Institute, China and the Philippines: Final Deliverable. Water and Sanitation Program, World Bank, Cambodia: Final Deliverable and Break-Even Analysis. 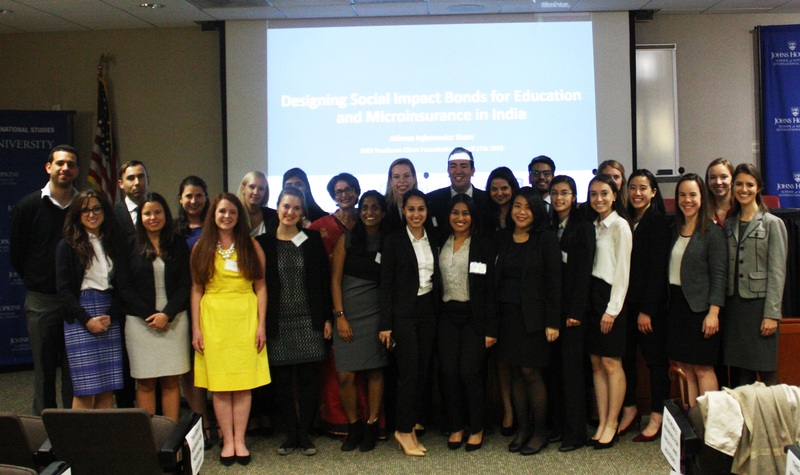 IDEV AY2014-15 Practicum Client Presentation on 4/29/2015 with Presentation Video and PowerPoint Presentation. This course aims to introduce students to contemporary discussions on designing and delivering basic education (primary and lower secondary level) services in low and middle income countries. The course pays special attention to lessons learned for improving access to and quality of education. The readings focus primarily on basic education with some discussion on early childhood education and care. We begin this 2-credit course with a general introduction about the ongoing debates at the global and national level about the successes and shortcomings of recent interventions for improving basic education in low and middle income countries. During the second section of the course, we will have the opportunity to learn about both demand and supply-side obstacles to providing basic education to all children. During the third and major section of the course, we will examine the evidence about the effectiveness of a wide range of efforts at improving access to and quality of basic education, including but not limited to class size, teacher training, cash transfer, and technological interventions. The course is run as a seminar so the students are expected to do the assigned readings prior to each session. At the end of the course, students will have familiarity with both the pertinent academic literature on basic education interventions in low and middle income countries, and the key reports published by international development organizations. Students will also have the opportunity to practice their policy analysis skills through the policy memo assignments. Study of development reveals a wide range of proposals for economic and political reform, and an equally wide range of political and economic constraints to reform. But the challenge confronting development practitioners is neither to decide which measures are optimal (the optimal is rarely implementable), nor to explain why action is infeasible. The aim is to find a tractable and promising way forward, given country-specific realities. This course will explore our evolving understanding of the tension between a normative vision of ‘good’ economic policy and ‘good governance’, and the practical challenge of identifying a feasible set of ‘next steps’ in a concrete setting – that is, of strategic sequencing. The focus will be on feasible ways forward in countries with low-incomes, and politics and institutions that are not supportive of development. Half of the classes will comprise lecture-style presentation and discussion of emerging concepts, approaches and tools that help us better think about the development constraints and options in institutionally challenging settings. The other half will be discussion-based; these classes will each focus on a country case study, and will explore alternative options for addressing a specific difficult development policy challenge in that country, in a way that highlights the intersection between economics and politics. The aim of this course is to provide students with a practical, relevant framework to apply participatory and principled approaches to deploying information and communications technologies (ICTs) and digital tools to meet international development goals and improve outcomes in low and middle income countries (LMICs). The course will equip students with the skills and knowledge they need to understand and contribute to the field of technology for development (T4D). Each session will include an introduction to relevant foundational knowledge that will provide an entry point whereby technologies such as mobile phones, sensors, drones and tablets can be designed and deployed to address problems in health, education, agriculture, governance and environmental sustainability. Cross-cutting themes such as information security, policy, gender, and M&E will also be explored. Students will have an understanding of the constraints and benefits of integrating technology into development programs through participatory, hands-on development of a project plan and budget. Money management is a fundamental part of everyday life, yet low-income families are typically excluded from the formal financial sector. The delivery of quality financial services (loans, savings, insurance, money transfers, etc.) at affordable costs to all segments of society is an important policy goal in closing the income gap and improving quality of life. This course is designed to give the student an overview of the history and key issues involved in “Financial Inclusion,” which has evolved as an industry from “Microfinance.” The course assignments are intended to teach practical technical skills and critical thinking about financial systems and the unbanked, assessing the financial needs of and designing products for the poor, operational aspects of managing a microfinance institution, and major debates about impact, socially-responsible investing, and future trends. This course is complementary to SA.400.724 Impact Investing: Financial Inclusion and Creating Value at the Base of the Pyramid, offered in Spring 2016. The objectives of this seminar are broadly two-fold: first, to gain a solid understanding of the patterns and constraints of gender inequality around the world up to the present day, and second, to review and debate what we know and don’t know about what policies and programs can work to close gender gaps, with a focus on developing countries. This 2-credit course will cover a broad range of topics, from economic opportunities, to gender based violence, to the global agenda and post 2015 framework. The Practicum is a course designed to provide students with the opportunity to apply their research, analysis and practical skills to an issue that is of direct relevance to a client in the international development space. Through the practicum, students not only refine the skills that they have gained but also make a tangible contribution to the practice of international development. Working in teams, and responding to client demands gives students a glimpse of working life upon graduation. Students are expected to meet all deadlines outlined in the Terms of Reference provided by the client. The IDEV Practicum is only open to second year IDEV students. For these students it also serves as a culminating educational experience and capstone, taking the place of an oral examination. The exception will be those students who quality for Johns Hopkins SAIS honors orals. Such students may wish to take the orals in addition to completing the Practicum. Basic services such as drinking water, sanitation, solid waste disposal and public transport are essential to development, yet in many countries their provision remains extremely problematic. While crowded cities with potholed roads, overflowing garbage heaps, and waterways clogged with untreated sewage are the images that come to mind when one thinks about missing services, rural areas are often even worse off. In this course we will review the main challenges to effective and reliable service delivery, the roles of key players, how these roles have been changing over time and how they may change in the future. We begin by discussing the theory of the state’s role in service provision, why some services are harder to provide, or some populations more difficult to serve. Next we focus on four sectors—drinking water, sanitation, solid waste and public transport. Problems specific to each sector, policies and programs used to address these challenges, to what extent they have been successful and why, and what approaches may work in the future, will be discussed. The course will pay special attention to innovations in service delivery—clearer incentives for regular service provision, strengthening municipal financing, integrating the private sector and communities into service provision. Students will study the costs associated with service delivery; service delivery planning; tools used for benchmarking utilities; and innovations in financing services. Development is a complex, multifaceted phenomenon that must be studied from a number of disciplinary approaches. Much of development theory focuses on economic growth, and students will have the opportunity to learn about the economic aspects of development in other classes. Economic growth is necessary to development, but not sufficient. Societies also change politically and socially, and politics, culture, and social structure are important in determining the quality of their institutions and the opportunities they offer their citizens. This course provides a general interdisciplinary foundation for the study of international development that includes history, theory, analytical tools, and institutions, and that will enable our students to be better prepared to analyze and address current issues. This is a required course for first year IDEV concentrators, and all IDEV affiliated students (MIPP/Minor). While there are fierce debates on the impact of immigration on advanced industrial countries, the effects of emigration and diasporas on the source country are poorly understood. This seminar will seek to understand the economic, political and social consequences of international migration and diasporas on countries of origin. Is the phenomenon of greater import in the current (and future) context than it has historically been and if so, why? How do selection characteristics of international migrants and reasons for leaving – whether as students, workers or refugees – affect the country of origin? What are the human capital effects ranging from the “brain-drain” of limited human capital to “brain-gain” effects arising and social norms and thereby influence social and political change? When do diasporas engage in “long- distance” nationalism that support more polar political parties and groups from diasporic networks? What are the different forms of economic engagement of diasporas with their countries of origin, ranging from remittances to trade to FDI, and why do these vary? Do diasporas transmit "social" remittances which reshape individual preferences engaged in conflict and civil wars? And what are the effects of destination country policies on immigrant selection, assimilation and deportation on the above questions? Covers a range of practical tools for development-related information gathering, including for project planning, design and evaluation. Grounded in survey and interview skills, also reviews participatory approaches, rapid appraisal, action research and many other techniques. Gives special attention to methods suitable for low budgets, limited time and nonprofessional management staff. Makes extensive use of real-world cases. Includes a team-based practicum in Washington. This course will help students develop critical skills in applying methodologies and strategies for the evaluation of international development projects. It will provide the conceptual and theoretical framework to help students navigate decisions about the most appropriate tools for assessing project achievements and evaluating their impact through formative, process, and summative approaches. Students will learn to identify sound evaluation questions, develop logic models to assess their utility for project monitoring and evaluation (M&E), and select performance and evaluation indicators and apply these in qualitative, quantitative, and mixed-methods designs. The course will provide insight into how methodological choices influence research design, data interpretation, and the strength of evaluation results. Students will learn to critique reported program results against standards of validity, reliability, efficiency, and effectiveness and will gain skills relevant for research uptake, instructing students how to present findings in appropriate formats for diverse audiences. Students will also be challenged to navigate ethical dilemmas of evaluation in the context of international development programming and reflect on appropriate alternative designs. The course will include brief lectures, in-class exercises, plenary discussions, and small group sessions. Case studies will be used to review and compare the M&E practices of major donors (multi-laterals, bi-laterals, and private foundations) and to critically assess examples of good and bad practice. The final project will showcase students’ skills in designing a rigorous and appropriate evaluation to answer a real world development question. Social Entrepreneurship: Driving Innovation in Development is focused on understanding social entrepreneurship and the challenges of building sustainable, impactful businesses that address critical underserved needs in emerging global marketplaces. The course aims to create in each student an appreciation of the qualities, values and skills of social entrepreneurs and also entrepreneurial opportunities in critical sectors of human need in complex, resource-constrained markets that are plagued by fragmented infrastructure, inadequate institutions and other governance challenges. Students will learn first-hand how businesses serving the needs of the poor contribute to community development and “do well by doing good”. The capstone project in the course is a group presentation based on a partnership with an existing social enterprise, or a newly conceptualized social enterprise based on student ideas. In addition to making a decisive impact on the field of international development, IDEV graduates have established an active alumni network and maintain a close relationship with the program. They also give back to the program in many ways - delivering presentations at brown bag lunches, assisting in the school's Admissions Office and on career development panels, offering job and internship advice to current students, and serving as the best possible advocates for recruiting new students. If you would like to stay connected, check us out on LinkedIn, Twitter, and Instagram. We appreciate the responses from all of you who have contacted us regarding your current endeavors. We hope to establish a complete list of IDEV student alumni updates. If you are interested in contacting our alumni or have additional questions regarding IDEV alumni affairs please contact the International Development Program at saisidev@jhu.edu. 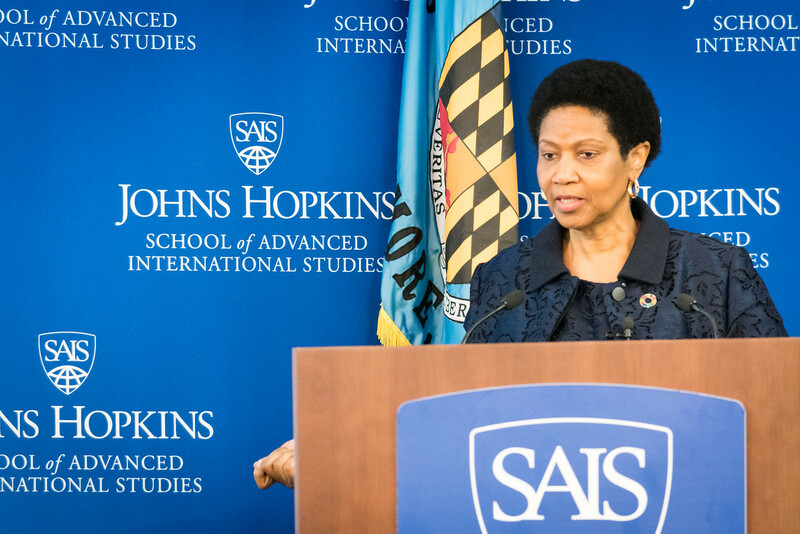 To refer a prospective student to Johns Hopkins SAIS, please click here. Alumni are welcome to walk in to the SAIS library at any time to use books and online resources for no charge, and can borrow books for a fee. Alums also have free access to some online resources remotely via KnowledgeNet. Check out the SAIS Library's Guide for Alumni for more information. We've launched our Alumni Newsletter in AY2015-16 to keep you updated with the latest news, research and events from IDEV, and to provide an opportunity for you to connect with your fellow alumni. Within the newsletters, you will find: alumni updates and contact information, news from the China Africa Research Initiative (CARI), information on how to contribute to SAIS Perspectives, updates on this year's IDEV Practicum Projects, upcoming IDEV events, information on new courses, professors, and more! 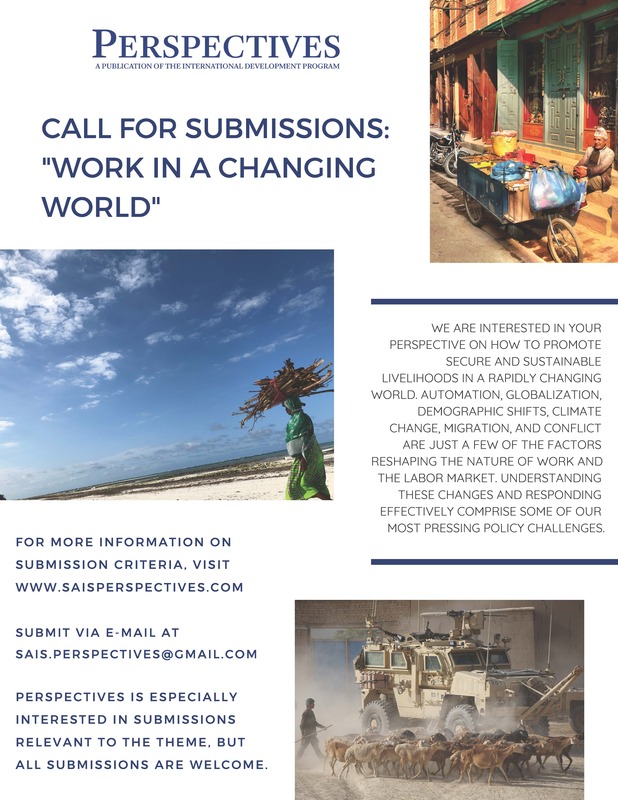 SAIS Perspectives is an annual publication of the International Development program at the Johns Hopkins School of Advanced International Studies (SAIS) in Washington, DC. The publication provides a forum for discussion of critical, cutting-edge topics with the goal of proposing innovative ways of thinking about the practice and policy of international development. Professor Cinnamon Dornsife, Faculty Advisor prior to 2014, promoting SAIS Perspectives. Click here for past publications. For Professors Nagpal, Dornsife, and Honig: Click on “Professor [Last Name]'s Office Hours”. You will need your e-mail address for making or changing an appointment online. If you need to meet with Professor Brautigam or Professor Nagpal outside of office hours, please contact Nicole Kazi at nkazi1@jhu.edu to schedule an appointment. According to "The Red Book: Johns Hopkins SAIS Student and Academic Handbook", enrollment at the school obligates each student to conduct all activities in accordance with the rules and spirit of the school’s Honor Code. The Honor Code governs student conduct. It covers all activities in which students present information as their own, including written papers, examinations, oral presentations and materials submitted to potential employers or other educational institutions. It requires that students be truthful and exercise integrity and honesty in their dealings with others, both inside the school and in the larger community. For more details, please see The Red Book. An online course is available to students to help learn about JHU academic standards, and how to avoid plagiarism during your studies. This course covers important topics on how to cite, quote, paraphrase, and summarize. To access this online course, please have your JHED and password ready and login here.